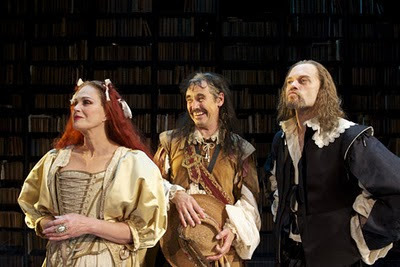 Joanna Lumley, Mark Rylance and David Hyde Pierce, above, in “La Bête." Patrick Stewart and T.R. Knight, middle, in "A Life in the Theatre." Bottom, Chris Mixon and Rachel Botchan in "Drama" from "The Sneeze." Photos from www.labetetheplay.com, Carol Rosegg and Gregory Costanzo, respectively. JUST because they are theater, doesn’t mean they are theatrical. Following is my take on three. With little to recommend David Hirson’s “La Bête” but its failure on Broadway in 1991, it’s hard to see the need for this revival. It’s a mess not even the accomplished Mark Rylance (Valere), the talented David Hyde Pierce (Elomire), the excellent Stephen Ouimette (Bejart) can put in order. Joanna Lumley’s (The Princess) sends us a postcard from a soap opera; her under-the-top performance lacks charm, wit or even camp. (See video: http://www.youtube.com/watch?v=l6Un8-vfcW0&feature=player_embedded). Set in the 1600s, “La Bête” is about a troupe of actors whose patron, The Princess, forces the company to take in a self-aggrandizing fool, or lose her patronage. It is also a farce about philistines at the gates. Director Matthew Warchus indulges too much of the chaos for which he has been praised, but thanks to the impeccable timing of his cast he serves the script’s rhyming verse well; it moves along, without any one actor stepping on another’s lines - brief respites from the monotony. Meanwhile, they meet by the stage door after the show, the young actor, John (T.R. Knight), and the old actor, Robert (Patrick Stewart), and compliment each other’s performance. They dish about co-stars we will never see and criticize each other ever so delicately. They rehearse a variety of scripts as if they are a two-man rep company. Stagehands move flats and bring in props. The actors act out scenes or put on grease paint. The actors change costumes at least two dozen times. We see them as WWI soldiers on the front lines; shipwrecked sailors on the “salty, salty water;” as civilized gents in Robert’s office discussing that fact that John knows that Robert is the father of the child his wife is bearing; at sword play in fanciful costumes. They are stretching and exercising at a barre. 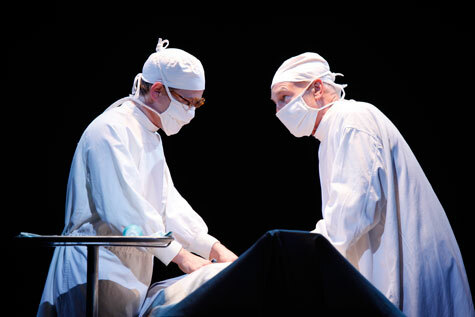 It is a droning 88 minutes that David Mamet takes from us for his “A Life in the Theatre,” a Broadway hit in 1977. The monotony here is broken up by a few funny scenes such as Robert doing a send-up of a “Les Miz”-type drama. Plenty of slapstick, and an entertaining bit has the French flag flapping in front of his face as Robert loses his wig. The audience was content to laugh at much less broad comedy. Even scene changes got applause. DM’s signature repetition of lines elicited a hearty response, too. John: Yes, I’m off. I’m hungry. Robert: You’re hungry, I can’t eat after a performance. Well, so, you’re off. DM, who is often prolifically profane (“Glengary Glen Ross,” “Speed the Plow”), to his credit shows considerable restraint here, using the “f “ and “c” words only sparingly. A livelier and more vibrant way for life to be spent in the theater is with “The Sneeze.” These vignettes based on Anton Chekhov’s stories and plays by Michael Frayn (“Noises Off”) are played out by The Pearl Theatre Company. “The Sneeze” is directed by the company’s first-year director, J.R. Sullivan, with gusto. Set in a rural Russian theater, the interludes between scenes include some singing, some dancing. The actors have excellent timing. Among the players, Chris Mixon stands out for his physical comedy in the title piece as well as in “Drama” and particularly in the finale, “The Proposal.” He is joined by Rachel Botchan, a veteran of the 26-year-old company in an equally stellar turn in “Drama” and “The Proposal.” The actors are not the only ones in the ensemble who merit a mention. Lee Stark as an inconsolable widow and Bradford Cover, the man who has come to collect her late husband’s debt in “The Bear,” give piquantly uproarious performances. The production has a great balance of comedy and romance.